This was my second lesson with new instructor. It was great weather again (I feel it’s almost confirming my choice). I got a text last night to read up on a new airport KBDR, Bridgeport, CT. I was sooo excited to go to a different airport! It glows it’s so special….or you know, light is reflecting off of it. 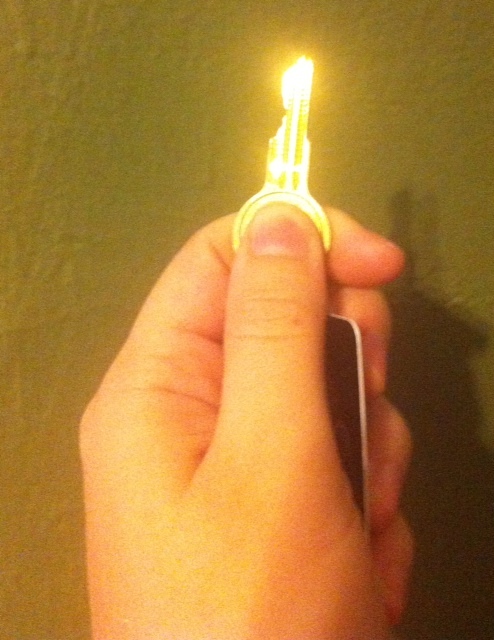 Before we started to pre-flight the plane, my instructor handed me the key to the plane, to keep! I feel pretty cool having a key to a plane on my key chain now. We get to the plane and pre-flight it and after starting it up, since I’m not onto VORs yet we just put in the GPS KFRG to KBDR and it has a nice purple line to follow to the airport. Since we have two radios as well we set up the frequencies we’ll have to change to after I get our ATIS. I go to the run up area and the right magneto runs a bit rough. He says to lean the mixture for a bit, let it run for about a minute and then full rich again and it’s fine. Something I have to get use to is that he prefers I don’t switch to Tower until I’m at the hold short lines, while before I was use to changing after the run-up. We head out and the north practice area is on the way, so I know where I’m headed no problem. Once over the Long Island Sound (where the practice area is) you can almost see Bridgeport airport across the way, but I had the GPS to help. It’s a quick ride. Call Tower 10 miles out, doing left traffic for the first landing, which involves going a bit wide to avoid going over rich people’s houses. What is nice about that airport, there is a tower still, but you hardly ever get extended on downwind so it’s much closer to a real pattern each time versus at Republic I hardly ever do a real pattern. My first few landings were coming in too high and too fast and the landings were a bit flat. My instructor was also really on me to break my bad habit of not climbing out at Vy, which I think he may have knocked it out of me by the end of the lesson. I got better about coming in at 60-65 knots half way through which helped a lot. I was sometimes still not straightening out the nose enough at the last second. I fixed the speed problems, now it’s just about holding the plane off better. I found out a bit high (though getting better) and I’m just not flaring high enough with the right timing to get a nice touchdown. A lot of it is I pull back too hard at a point and balloon. With this instructor though my landings aren’t as great, but he’s not talking and coaching me through them, which is what I need. I need to not have someone telling me what to do, but get the feeling by myself. We can talk afterwards about what wasn’t right. I think my landings have been better, but I haven’t been as confident I can land the plane by myself without freaking out as I am now. Another lesson scheduled tomorrow so hopefully it goes well! Weather could get iffy, so we’ll see. Today, I had a flight lesson. Today, I was excited before I went flying. Today, I was happy when I left my flight lesson. Those three things haven’t correlated in awhile. It solidified my decision to change schools and instructors. It was my try out of a different school today. I was excited to see the difference. And boy, there was a difference. This school just this guy and his 3 buddies own the planes and teach. They are older and they do this for fun not to make tons of money (what in aviation CAN you do to make tons of money?). The 152 was awesome. I think I’m just impressed there is a GPS, a touch screen map in there so I can see the airspace and traffic around me. I’m going to get spoiled. I learned things about pre-flighting that I didn’t know before. He showed me more of the inner workings of the plane, which is always good to know. I never even knew how to visually check the brakes. The radios were much more complex in this plane so it’ll take me a bit to learn them correct. I accidentally was talking to ground instead of tower, so got that embarrassment out of the way right off the bat. Waiting to take off I found the mysterious seaplane that I see all the time landing on the East River, it was taking off in front of us. I saw it flying around while waiting for the train out there, my instructor confirmed that it had recently come back and does fly there all the time. Anyway, we went out to the south practice area and did slow flight. I was amazed on how well I held the heading, something I always struggled with in the past. He, unlike my other CFI, was very set on making sure the stall horn was sounding during slow flight. My boyfriend, when we did simulator lessons, always make me fly with the stall horn sounding. I was always surprised in lessons when that wasn’t a big deal. Then went into steep turns, they weren’t bad. My progress check helped with that, but he gave me a good pointer of at 30 degrees is when the back pressure needs to be more. Then went straight into emergency procedures. He actually had me fly pretty low (and probably freak out all the beach goers) and do a pattern to set up to land in a parking lot, I’ve never thought of doing a pattern for an emergency landing so that was new. 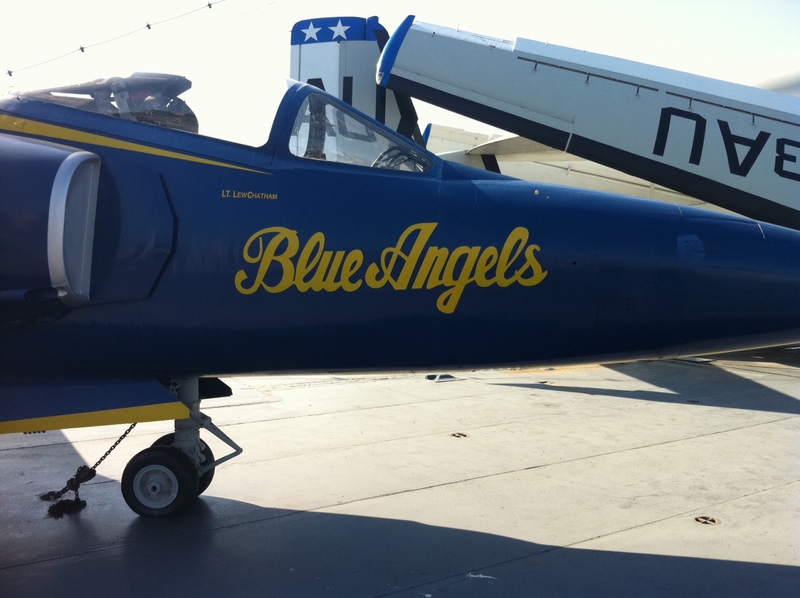 Also, with this plane, he told me if I immediately put it to all the way nose up trim it is 60 knots (best glide speed). What an awesome cheat! We went back in to do touch and goes. It had been awhile since doing crosswind landings. I’m always coming in a bit high and fast so working to fix that. Today I think I was pulling back too high so would balloon up slightly, but it was getting better by the last landing. Afterwards, we talked a lot. Some bad habits already have to get rid of, such as: climbing out at a higher airspeed than V(y) (I knew this, I told him this, it has do to with seeing the horizon better), remembering right rudder on take off, and holding in crosswind correction through take off. We talked a bunch about landing after filling out paperwork and talked about other planes and things that scare me. I told him, in the air, I was a bit scared by accelerated stalls still and he said he was surprised I had even done them with my number of hours, so that lead us later to talking about spins and then Cirrus in spins and their parachutes. He drove me to the train (he also picked me up which was super nice) and I as soon as I got home I logged in to schedule 3 more lessons this week. I FINALLY get to fly as much as I originally wanted to 3-4 times a week. I’m happy. I had the awkward call to my other flight school to cancel all my lessons and withdraw from the club. I see they only cancelled one, so I’m expecting a call to get an explanation. But good news, I should be blogging a lot more with more lessons! I’m really excited by this club and instructor. He seems to care, I loved getting a text at 6:45am about the weather so there was no stressing going to the train unsure of the weather. He also said that my boyfriend could easily get checked out in any plane they had in less than an hour. I may have to convince him to do it so we can take a flying trip! My poor friends. They have to put up with a lot of airplane talk. They even have to accompany me to cool (for me) airplane stuff when my go-to pilot is working. 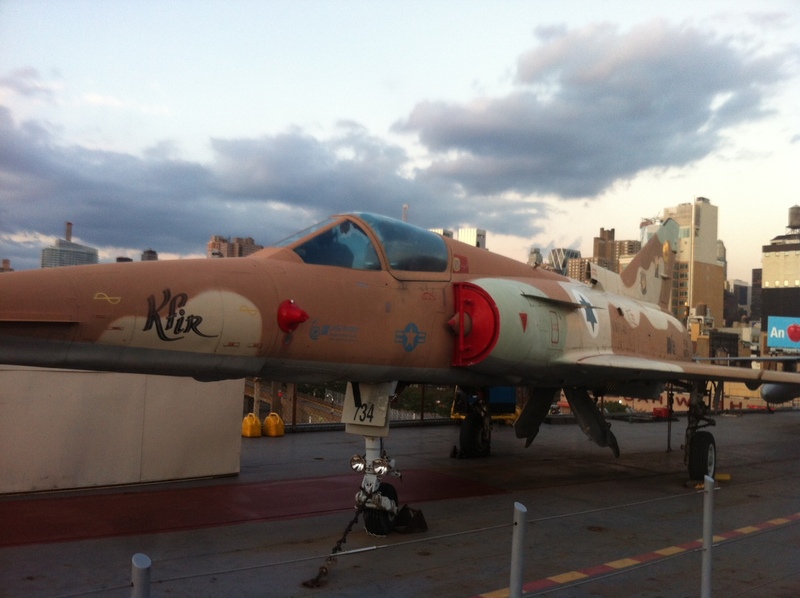 Last night, I dragged a friend along to see a movie on the USS Intrepid flight deck. If you don’t know what the Intrepid is, it’s awesome. 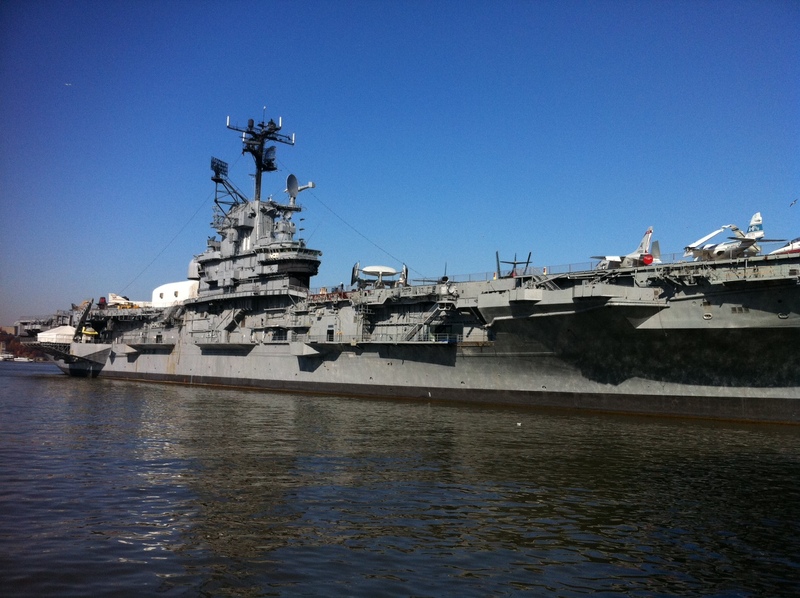 It’s a retired air craft carrier made into a museum on the Hudson river. There are bunches of old planes, helicopters, and space stuff on it. 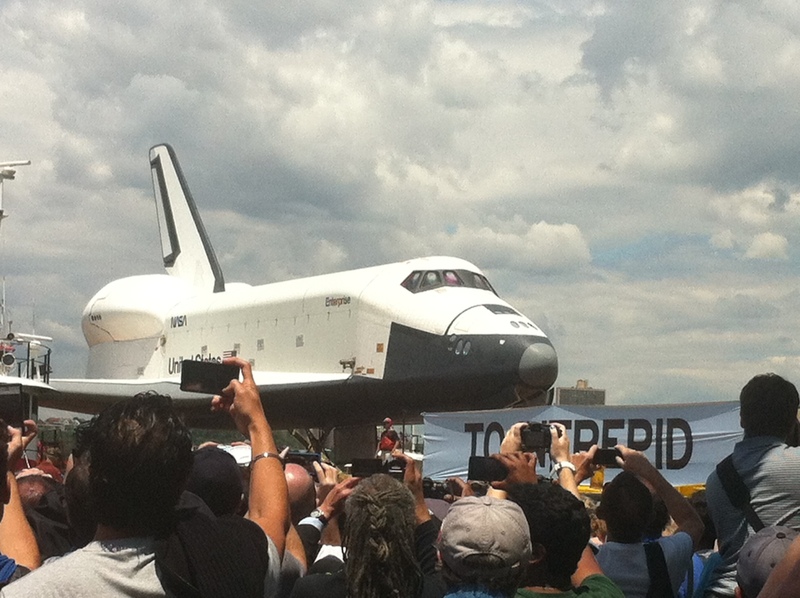 There’s even a space shuttle on it, the Enterprise. I got to watch it be delivered last year and lifted onto the ship. It came by 747 into Newark, my boyfriend got to see it on the tarmac. The movie was the original Star Trek movie, which I had never seen before, but I really just wanted to go on the flight deck again, this time for free. We were let on around 7:30 and had to wait until sun set so got to wander around the flight deck until 8:50, our lawn chairs all set up at a prime spot. A great part was they played a movie about the Intrepid before the actual movie. I learned that the it was hit with 3 Kamikazes during WWII. And then was also used as an FBI base after 9/11 happened. 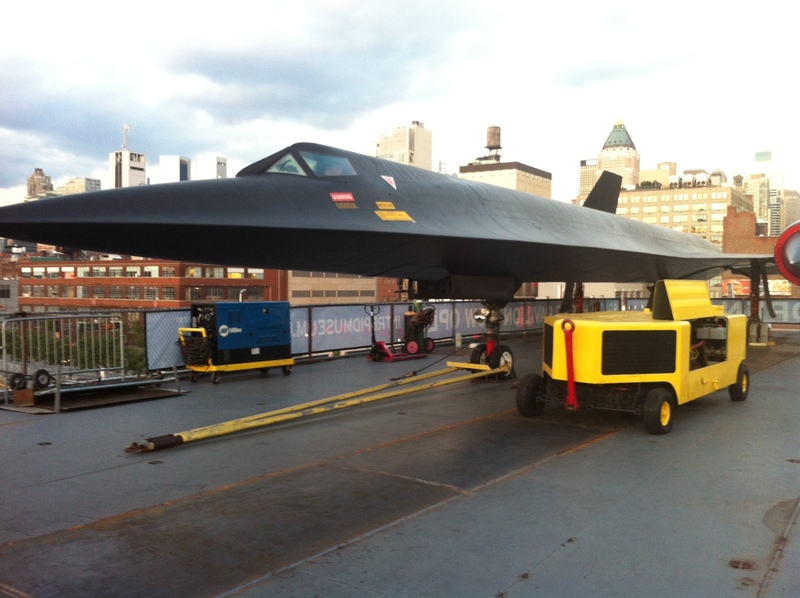 A-12 Blackbird, replaced by the SR-71 later. Look at that huge tow bar! I just love this place, it’s so fun and cool with history. I think I also feel an attachment to it because my grandpa served on an aircraft carrier in the Korean War, but not this specific one. I also love it because my boyfriend’s step-dad (who inspired him flying was possible) flew an A-12 Blackbird which is on it as well. So it connects both of us with people we love and aren’t with us anymore. I grew up loving the Blue Angels, they would perform every other year at the Chicago Air and Water Show. Thanks everyone for all those supporting comments from my last post. I really needed that and appreciate it! I took the rest of that day to calm down, my boyfriend was home the next so I took the day to relax and try not to think about it too much, it was on the back burner. We did spend a good hour on Pinterest together looking at plane pictures though. I realized quitting isn’t an option, at least just yet. I don’t think I’d be happy if I quit. I feel there are things in my life that I had to give up before I got to a point where I felt my success was enough, and I don’t want flying to be added to that. This morning at the suggestion of someone on a pilot forum I called another school/flying club. They have a 152 available. I had to leave a message and he called me back within the hour. I was actually at a diner having lunch with a friend, but I really wanted to take the call and she understood. I talked to one of the owners for 15 minutes, explained where I was coming from and he talked a lot about the school, pricing, philosophy, etc. First thing that seems great is they only charge for the time in the plane for the instructor. My school does tact on extra time for walking out to the plane, signing logbook, etc. So if you only do 1.1 hours of flying you only pay for 1.1 hours of instructing. Also, apparently, once you get okayed to solo in the plane (or checked out in a new plane) you get the keys to have and can schedule and go to the plane anytime you want even if the office isn’t open. The FSDO also use to use their planes for their own training, so he said the FAA is pretty happy with their maintenance and up keep of the planes. This guy also just had two commercial students finish last week, has an open schedule. He is also teaching his two daughters to fly as well. I’m pretty happy with how he sounds. I scheduled a lesson on Monday to check it out and see how it is. I do hope the weather is good. I still have all my lessons still scheduled with my other school (to be safe) but that means I fly with them on Tuesday. I’m hoping for Monday, so I can make a decision. I’m trying to stay calm and not get too excited, because I feel every time I get excited something goes wrong. That may just be the superstitious theatre person in me. I feel like Eeyore from Winnie the Pooh in my training. Seriously. Remember how I was suppose to fly with another instructor today? Yeah, that didn’t happen. I got there and preflighted the plane and waited until 12pm. I thought it was a different instructor than it actually was, but that’s fine. I got called over to the desk and there was a problem, he (CFI #3) could not fly in the 152. Really? They originally had me with a different CFI (#2) first, but switched at the last minute. The original CFI (#2) could fit in the 152 but had a lesson scheduled in the light sport, so he wasn’t switching. There was one other instructor (#4), he did my progress check, but apparently he couldn’t do it, nor would I really want to face him again. So I was sent home. No flying, no ground time, or anything. Four hours and $26.50 wasted on getting out there. When I was on the subway home my regular instructor texted asking how it went and I told her what happened. She thought it was ridiculous and apologized for that happening to me saying it wasn’t fair that it happened to me. I sent an awkward text back saying I’m just kind of use to everything going wrong in my training, weather, planes being gone, work schedules…and I told her it wasn’t her fault. Where do I go from here? I’ve been feeling stuck and pushed around a bit lately. My boyfriend is home today and he thinks I should just quit, at least from a money stand point. Almost $5,000 spent thus far, his reasoning is I could probably have a lot more fun for less in another hobby. He asked if I was even having fun anymore. I don’t even know. I do when I get to fly and I do well, but there is a lot of frustration. I actually took an Irish Dance class last night, my first in 6 years. I had a lot of fun for 2 hours, it was hard to get back into shape and learn new steps but I picked it back up quickly. Something I’m good at and it only cost me $30 for that time. I look at it as here are my options: 1. Try to stick it out 2. Switch instructors, see if I can get landings with someone else and whose schedule is more open (question is, who is able to fly the 152) 3. Switch schools, go to one that doesn’t have these major screw ups and feels a bit more welcoming 4. Cut my losses and quit. Today has been emotional for me from happy to upset to frustrated to angry back to upset to annoyed. So I know I can’t make the decision today. I might take a discovery flight with another school just to see how it is. I haven’t really figured out what I’m doing. I’ll keep you updated as I know. Sometimes it is extremely frustrating not having a car. I’m actually okay with traveling for two hours to get to the airport versus the 45 minutes it would take by car. What is frustrating for me is that how the weather looks like it is doing two hours before a lesson can be much different than what it actually does two hours later. As you can guess, my lesson was cancelled today due to weather. But by 12pm the weather turned out fine. Argh. I’ve thought about borrowing a friend’s car, but I don’t want to abuse that because I will need to do it to get in my night flying and probably for my checkride. Zipcar is too expensive $10.25 per hour. Definitely renting a car would be too expensive and I’m not 25 so even more. So I’m kind of stuck with guessing. I also got a call from my CFI today and she got a last minute charter flight (which I didn’t know she did part-time charters, therefore she has 3 jobs: charter pilot, CFI, and figure skating instructor) so we could cancel or put me with another instructor. I said I’d go with another instructor if it was looking good tomorrow. At first it was one I didn’t know, and then I see I got an email and changed to one I do know. I’m actually kind of really excited for tomorrow. New perspective and I totally have a soft spot for this guy because he use to work the front desk and when I first started out I talked to him all the time because I was always cancelled due to weather (shocker!) and he also gave me a ride to a far away train station so I could get home earlier. We’ll see how his teaching is! I’m back in the air! Felt really nice too. I had a 4 hour block scheduled, but was only able to use an hour of it. I rolled over in bed and checked the weather around 6am, broken clouds at 800-900 ft. I decided to sleep until 7am and check it again, I could still make the 8am train if it was better. Well, it wasn’t. I rolled back over and went to sleep until 8am, texted my instructor that the weather looked not good, but looked better in the afternoon. So we planned on me coming in at 12pm. I got up and got ready and 10am rolls around, I’m leaving my apartment and she asks when my train there is and I reply 10:25am and says it’s still bad but should clear up. I let her know I’ll check the weather before I start walking from the train station just in case. I get there. Preflight, I’m starting up the engine and it suddenly fails. I wasn’t really sure what happened because it looked alright and I continued on the checklist. We tried to start it again, no dice. We waited a few minutes, gave it another prime and started it just fine. My instructor thinks that maybe I pulled the power back too quickly (I had it around 1500rpm vs. 1000rpm when it started) and fuel hadn’t gotten to all cylinders. Continued onto the checklist and then the radio wasn’t working. Well, this plane is 10 years older than me so it can get beat up. The volume knob wasn’t really working. My instructor turned it a bunch of times hoping it would catch and it did so off we went. During run up we left it at idle a bit longer just to make sure the engine was okay. Took off and there were clouds near by, but not too bad. Do a regular pattern (no one was in the pattern, well, maybe 2 people but that’s RARE) and my first landing is almost perfect. It felt great. All three phases were there, flare was good, touch down was nice and soft. Second one, I was cleared for touch and go before I even turned in the crosswind. My instructor asked for a short approach, was approved, and pulled the power on me. It was the first engine out one we’ve done due to the business of the airport. I didn’t do too bad, I feel to use my trim more to keep 60 knots, but I made the runway and the landing was pretty good. A little bit crooked, but not unsafe or bad. I got in 4 more landings after that. I learned that big puffy cumulus clouds are terrifying when flying at them, unlike the fun cirrus looking clouds we were near before in another lesson. I’m also not use to normal patterns, so I was coming in a bit high because I’m not use to turning so early on base. A lot of my landings were good, sometimes a bit crooked because the wind was straight down the runway and my instructors thinks at least once the wind came suddenly from somewhere else and it wasn’t enough time for me to fix it. For the most part, after 3 weeks off, I was pretty happy with my landings. A thunderstorm was rolling in and we could see if inching nearer and had to stop after only an hour. I’m hoping tomorrow brings good weather and better landings! Monday I get to fly again! (Weather permitting) I’m excited. I know I’ll be pretty rusty so I grabbed the boyfriend and made him play Flight Simulator X with me for a bit this morning. I know it’s not exact but I have noticed in the past when I play the simulator before a less I do improve. It couldn’t hurt. We have it saved just to be short final to really work on the last part and do it quickly over and over again. I was having trouble with lining up with the center line and also a bit with power management. I got the power management better but still difficulty with the center line. After a little bit he stopped using a 172 and kept switching planes on me every time. It was from fighter jets to Cessna 206 to multi-engine props to commercial jets. Sometimes it was frustrating because it would not be anywhere near stabilized approach but he said that’s what I really need to work on is correcting problems and correcting them in a timely manner. Some were super easy for me to correct and the majority of them were better than my 172 approaches because I wasn’t over thinking them. It was definitely a learning experience. I wasn’t too frustrated by the end of it and got some better tips on landing. I’m excited to try them out on Monday. The only disappointing thing is that his trip gives him a long overnight in Portland, ME which I don’t get to go on because of my lesson. I feel like I’ll never get to on a trip with him while I’m learning to fly. I guess I can’t really complain because I’m lucky to have both options available for me! Four hours of lesson set for Monday, I’m hoping it goes well! I love Pinterest. It’s great and has been awesome for making things and getting me awesome clothing. But I also love to pin aviation stuff. I decided (again, since I’m grounded for awhile) to start a Cessna Chick Pinterest. Hopefully, it’ll introduce some of you men to the jobs of Pinterest and that it can be used to post more than crafts, fashion, and weddings. I’ll keep adding more as much as I can.